We have taken the most commonly requested width (1 ½”) and determined the 3 most requested colors which are Black (black thread), Dark Brown (black thread) and Light Brown (white thread). We realize our criteria is somewhat narrow as far as a selection – but it has to be if we are to complete shipments within that short time frame. These belts are hand crafted the same way as every other belt in our shop. We have invested our time and money in this program so that, if the criteria we have set meets your demand, you won’t have a lengthy wait. They are punched with 5 holes positioned 1” apart or 7 holes positioned 3/4″ apart using an oblong punch. 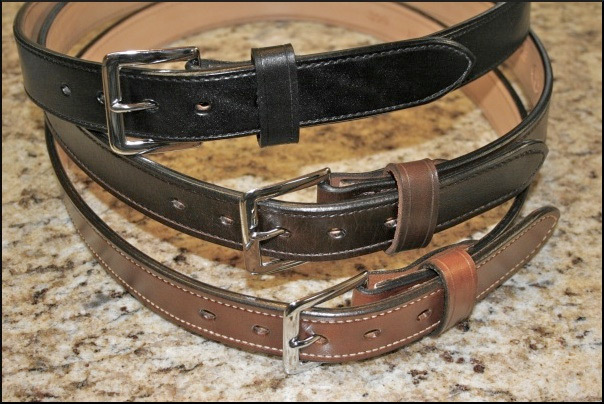 These belts are $79.95 + $8.95 shipping & will be shipped the next business day. We try to keep between 175 and 200 Quick Ship belts in stock at all times. So availability is no problem.